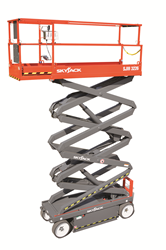 Limited time offer on Skyjack SJIII 3226 DC Electric Scissor Lift rentals. This special offer lets you rent the quality you buy at an affordable price. Hawthorne Cat, the exclusive Cat® equipment dealer in San Diego, the Hawaiian Islands and the Pacific Region, announces a limited time rental offer for June and July only. Rent the Skyjack SJIII 3226 DC Electric Scissor Lift for only $660 per month (regularly $975 per month). Offer is valid for San Diego customers only and expires on July 31, 2017. The Skyjack SJIII DC Electric Scissor Lift gets the job done. It boasts a 32-inch wide platform that reaches a maximum height of 26 feet, yet is narrow enough to fit through standard doorways. It also features a lifting capacity of 500 lbs. Additional features include full height drivability, dual holding brakes, rear two wheel hydraulic drive, low voltage battery protection, all motion audible alarm, and relay based control system.